Due to their elegant feature, Moduline’s aluminum metal cabinets have also been used to display stylish trophies. Fanatics of racing and sports who love displaying trophies can do so in their garage or shop with one of Moduline Cabinet’s ProII™ Series garage cabinet valance and trophy shelves. If you participate in, and attend racing events, this is an opportunity that you will always appreciate, as you have the chance to display your trophy collection. The different trophies and awards you have can be displayed with aluminum metal cabinets all over your family home, shop, or office. Need cabinets with the capability to stand up to elevated temperatures? That are high alloy aluminum with heat and corrosion resistance? Moduline’s metal cabinets are designed to serve all these needs. The garage and trailer cabinet layout systems are in high demand, fit for trailers, garages, and shops that house racing and high luxury cars, including Porsche and Ferrari. The cabinets have also been very effective for chemical equipment, due to their high corrosion resistance. Despite the many uses for custom metal cabinets, individuals opting to purchase them are advised to make the right choices of cabinets that would best serve their purpose. There are very many and different types of cabinets that can be fabricated. 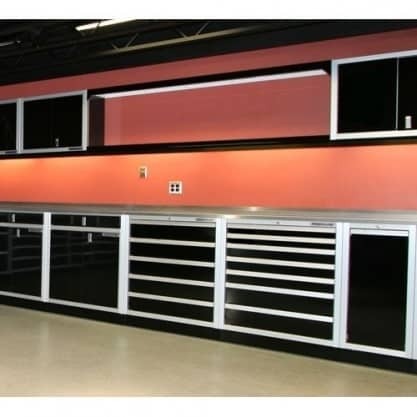 Moduline Cabinets offers custom designed aluminum cabinets made to specification of your garage, office, or shop. Contact us for a free consultation.